Sophia Bush dazzles in a red dress as she steps out for 2019 Hollywood Reporter’s Most Powerful People in Media on Thursday night (April 11) at The Pool in New York City. Joining the 36-year-old Chicago P.D. actress at the event was Naomi Watts who donned a pretty white blouse and black trousers for the event. Other stars at the event included Brooke Shields, Christine Baranski, Girls‘ Jemima Kirke, Peaky Blinders actress Annabelle Wallis, model Anne V, along with TV personalities Gayle King, Savannah Guthrie, Samantha Bee, and Martha Stewart. FYI: Naomi is wearing a Zimmermann top and pants, Gianvito Rossi shoes, a Miu Miu bag, and Jennifer Fisher jewelry. Christine Baranski, Susan Sarandon, & Cheryl Hines to Star in 'Bad Moms' Spinoff! Another Bad Moms movie is in the works! STX Films announced at the 2019 CinemaCon that they are working on the upcoming movie Bad Moms’ Moms – based on the grandmother characters who were first introduced in 2017’s A Bad Moms Christmas. Christine Baranski, Susan Sarandon, and Cheryl Hines will be reprising their roles in the film. The first installment – Bad Moms – was released back in the summer of 2016 starring Mila Kunis, Kristen Bell, and Kathryn Hahn. No other information about Bad Moms’ Moms has been released yet. Christine Baranski sits down for an interview at SiriusXM Studios on Tuesday afternoon (March 12) in New York City. The actress opened up about the new season of her CBS All Access series The Good Fight and she also revealed that she will be in the series finale of The Big Bang Theory! Christine will reprise her role as Leonard’s mother Dr. Beverly Hofstadter. “There were many episodes where I couldn’t show up in L.A. because of The Good Fight so I’ve actually Skyped episodes from my producer’s office in Brooklyn,” she revealed. She even joked that filming shows via Skype might be her future. Samantha Barks looks gorgeous on the red carpet at the Metropolitan Opera’s Opening Night Gala on Monday (September 24) at Lincoln Center in New York City. The 27-year-old Les Miserables actress, who recently made her Broadway debut, was joined at the event by her Pretty Woman co-stars Andy Karl and Orfeh, who are married in real life. More stars who attended the event included Patricia Clarkson, Christine Baranski, Blythe Danner, Rachel Dratch, Scandal‘s Katie Lowes with husband Adam Shapiro and their former Waitress co-star Erich Bergen, designer Zac Posen, designer Ariana Rockefeller, and actress Jill Hennessy. See our other post to see more celebs at the event! FYI: Samantha is wearing a Michael Kors Collection gown. Patricia is wearing a Temperley London dress. Ariana is wearing a Bibhu Mohapara gown, Tabitha Simmons shoes, and an Edie Parker clutch. Katie is wearing a Roksanda dress and Mercedes Castillo shoes. Is There a 'Mamma Mia! Here We Go Again' End Credits Scene? The Mamma Mia sequel, Mamma Mia! Here We Go Again, is hitting theaters in just a few hours and it’s expected to dominate this weekend’s box office! The film is currently receiving some fun reviews, and when the credits begin rolling, you’re going to want to stay in your seat! There’s a song performed in the credits and after the credits, there’s a quick, fun blooper scene! 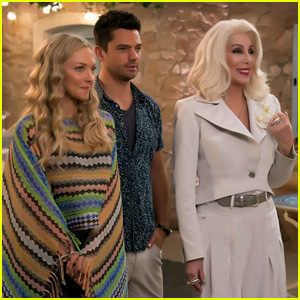 Returning to the cast are Amanda Seyfried and Dominic Cooper as Sophie and Sky, Meryl Streep as Donna, Pierce Brosnan, Stellan Skarsgard, and Colin Firth as Sophie’s three possible dads: Sam, Bill and Harry, and Christine Baranski and Julie Walters as Tonya and Rosie. Joining the cast from the first film Lily James as Young Donna, Cher as Sophie’s grandma, Alexa Davies as young Rosie, Jessica Keenan Wynn as young Tonya, Jeremy Irvine as young Sam, Josh Dylan as young Bill, and Hugh Skinner as young Harry. Check out the movie, in theaters this weekend!